/ Search Facebook for Old Posts and Updates? Search Facebook for Old Posts and Updates? My ex is claiming that during our divorce I posted on Facebook about what a jerk he was. He is a jerk, but how can I review my old Facebook posts and status updates to see what I actually posted? Now you’re saying What? That’s a search engine? Uh, okay. It really is. And it’s darn powerful too. To proceed, I’ll just press Return on my keyboard to execute the search. The results are, well, big. 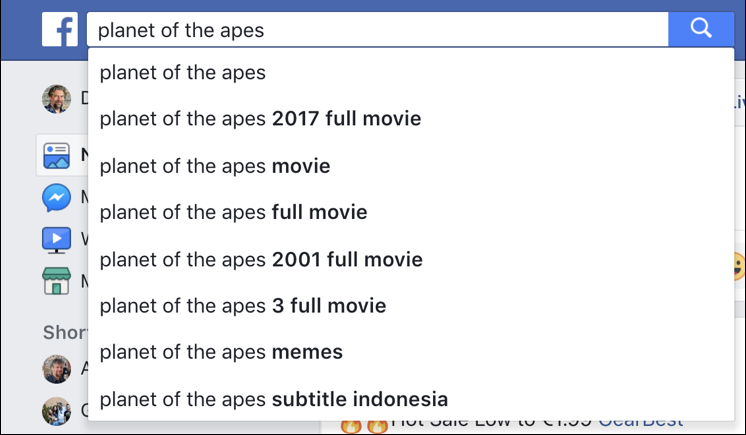 Start by looking along the top at the search result categories. 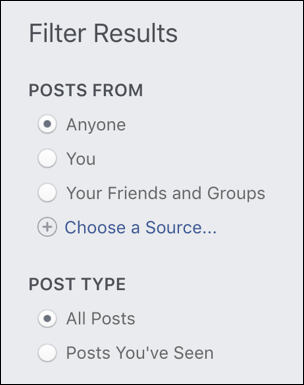 You can easily narrow down the results to just Posts, People, Photos, Videos, Marketplace, Pages, etc. Want to search for groups about Sailor Moon or Facebook pages that match your favorite brand name? Now you can see how to do that: Do the search, then click on the corresponding tab. Easy. It’s a movie but it’s a board game too, a board game I reviewed over on my GoFatherhood site! Notice that they’re not in chronological order. I can’t explain why that’s the case, but Sept 19 is more recent than Sept 10 and should be on top. It’s not, however, so it means you’re going to have to do the work to scroll down and see what’s a match. This time the ordering makes sense, at least, with 2012 appearing above 2011. Generally speaking you can click on the date and time information to get to the post (in the latter example, that’d be “October 9, 2011 at 9:56 PM”) but sometimes it doesn’t seem to work. Something messed up in the Facebook database? Maybe. 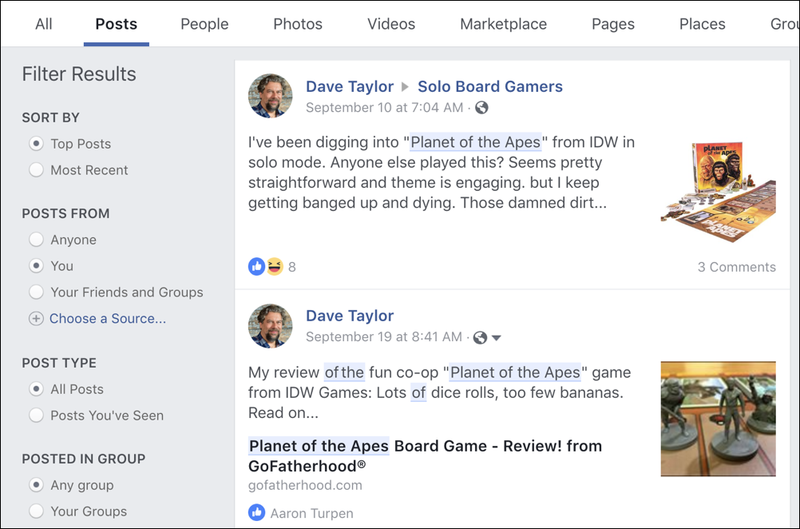 And that’s it, a quick primer on how to use the Facebook search engine to dig back into your old posts and find what you posted and whether it’s all that bad or not. Note that even if you edit or delete the old posts that are the worst, it’s quite possible your ex or his attorney have already archived or printed copies, so that’s not a guarantee it’ll protect you. Good luck! Pro Tip: I have a lot of Facebook help here on the site, please take a few minutes to check it out! 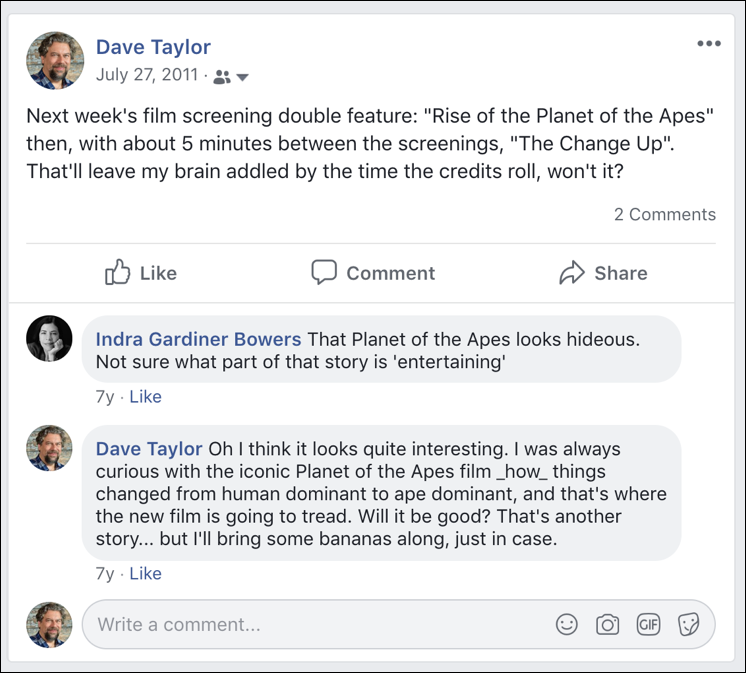 Also, don’t forget to follow Ask Dave Taylor on Facebook too. Lots of conversation that only appears there that you won’t want to miss.